"Lean Back" is a song by American hip hop group Terror Squad. It was released as the second single from their second studio album, True Story, on June 8, 2004. An uptempo hip hop song built for the club environment, it features Fat Joe with Remy Ma handling the second verse. It topped the Billboard Hot 100 for three weeks from August 21, 2004 and topped the R&B charts for more than a month. The song appeared in the video games Need For Speed Underground 2, Def Jam Rapstar and The Hip Hop Dance Experience. Jessy Terrero and Raul Conde directed the music video and filmed it at a mansion at Hollywood Hills in Los Angeles. Fat Joe described the dance in the video as throwing back the right shoulder to the beat of the song. The video features cameos from DJ Khaled, N.O.R.E., Tego Calderon, Tony Sunshine, Kevin Hart, and Lil Jon, as well as the production-duo Cool & Dre. Jason Birchmeier of AllMusic called the song "a perfect club-ready duet between Joe and Remy Ma that boasts a trademark Scott Storch beat and a memorable singalong hook and dance-along step". Vibe called the song a "summer classic". In 2008, the song was ranked at no. 55 on VH1's 100 Greatest Songs of Hip Hop. The official remixed version of the song, featuring Lil Jon, Eminem, and Mase is available on Fat Joe's 2005 album All or Nothing and Lil Jon's Crunk Juice remix disc. The official remix is more uptempo and contains a new beat with a crunk–like feel to it. However, there are two different versions of the remix. The All or Nothing version, the main remix, features an additional verse by Remy Ma and was released in July 2004. The Crunk Juice version features Lil Jon's vocals throughout the song, omitting Remy Ma's verse. On both versions, Mase's verse is in line with his then-clean style of rapping (as heard on Welcome Back). Fat Joe also released a remix in tribute to his Puerto Rican ancestry, featuring Tego Calderon and Tony Touch. Other remixes of the song are performed by Chamillionaire, in The Mixtape Messiah titled "Body Rock", Lil Wayne, Max B, Jadakiss, U.S.D.A., and G-Unit. Also, mashup artist Girl Talk layered "Lean Back" over Spacehog's "In the Meantime" in his album All Day. Houston rapper Lil' Flip did a freestyle over the song as a diss towards Atlanta rapper T.I. ^ Moss, Corey (September 24, 2004). "Remy Martin Provides Steamy Action On Terror Squad Video Set". MTV News. Retrieved July 3, 2011. ^ Reid, Shaheem (May 3, 2004). "Fat Joe Might Start A Dance Craze By Hardly Dancing". MTV News. Retrieved July 3, 2011. ^ Birchmeier, Jason (2004). ""True Story" - Overview". Allmusic. Retrieved 2007-11-10. ^ "100 greatest hip hop songs (60-41)". VH1. Archived from the original on October 2, 2008. ^ Patel, Joseph (July 22, 2004). "Eminem, Mase Pitch In To Make 'Lean Back' Even Hotter". MTV News. Retrieved July 3, 2011. ^ Lil Flip. "Lean Back Freestyle (T.i. Diss)". SongTextMania.com. Retrieved 2 July 2013. ^ "Australian-charts.com – Terror Squad feat. Fat Joe & Remy – Lean Back". ARIA Top 50 Singles. Retrieved December 10, 2011. ^ "Ultratop.be – Terror Squad feat. Fat Joe & Remy – Lean Back" (in Dutch). Ultratop 50. Retrieved January 7, 2019. ^ "Ultratop.be – Terror Squad feat. Fat Joe & Remy – Lean Back" (in French). Ultratip. Retrieved January 7, 2019. ^ "Danishcharts.com – Terror Squad – Terror Squad feat. Fat Joe & Remy". Tracklisten. Retrieved December 10, 2011. ^ "Offiziellecharts.de – Terror Squad feat. Fat Joe & Remy – Lean Back". GfK Entertainment Charts. Retrieved January 7, 2019. ^ "Chart Track: Week 41, 2004". Irish Singles Chart. Retrieved December 10, 2011. ^ "Italiancharts.com – Terror Squad feat. Fat Joe & Remy – Lean Back". Top Digital Download. Retrieved January 7, 2019. ^ "Nederlandse Top 40 – week 42, 2004" (in Dutch). Dutch Top 40 Retrieved December 10, 2011. ^ "Dutchcharts.nl – Terror Squad feat. Fat Joe & Remy – Lean Back" (in Dutch). Single Top 100. Retrieved January 7, 2019. ^ "Charts.nz – Terror Squad feat. Fat Joe & Remy – Lean Back". Top 40 Singles. Retrieved December 10, 2011. ^ "Official Scottish Singles Sales Chart Top 100". Official Charts Company. Retrieved January 7, 2019. ^ "Swisscharts.com – Terror Squad feat. Fat Joe & Remy – Lean Back". Swiss Singles Chart. Retrieved December 10, 2011. ^ "Official Singles Chart Top 100". Official Charts Company. Retrieved December 10, 2011. ^ "Official R&B Singles Chart Top 40". Official Charts Company. Retrieved January 7, 2019. ^ "Terror Squad Chart History (Hot 100)". Billboard. Retrieved December 10, 2011. ^ "Terror Squad Chart History (Hot R&B/Hip-Hop Songs)". Billboard. Retrieved December 10, 2011. ^ "Terror Squad Chart History (Pop Songs)". Billboard. Retrieved December 10, 2011. ^ "Terror Squad Chart History (Hot Rap Songs)". Billboard. Retrieved December 10, 2011. ^ "2004 Year End Charts – The Billboard Hot 100 Singles & Tracks". Billboard. Prometheus Global Media. Archived from the original on October 1, 2012. Retrieved December 10, 2011. ^ "2004 Year End Charts – Hot R&B/Hip-Hop Singles & Tracks". Billboard. Prometheus Global Media. Archived from the original on September 29, 2012. Retrieved December 10, 2011. ^ "2004 Year End Charts – Hot Rap Singles Titles". Billboard. Prometheus Global Media. Retrieved December 10, 2011. ^ "Decade End Charts – Hot 100 Songs". Billboard. Prometheus Global Media. Retrieved December 10, 2011. ^ "Decade End Charts – R&B/Hip-Hop Songs". Billboard. Prometheus Global Media. Retrieved December 10, 2011. ^ "British single certifications – Terror Squad ft. Fat Joe & Remy – Lean Back". British Phonographic Industry. Select singles in the Format field. Select Silver in the Certification field. Type Lean Back in the "Search BPI Awards" field and then press Enter. 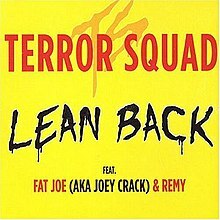 ^ "American single certifications – Terror Squad – Lean Back". Recording Industry Association of America. If necessary, click Advanced, then click Format, then select Single, then click SEARCH.